Light Requirements: Full Sun to light afternoon shade. Water Requirements: Minimal water needs once established. 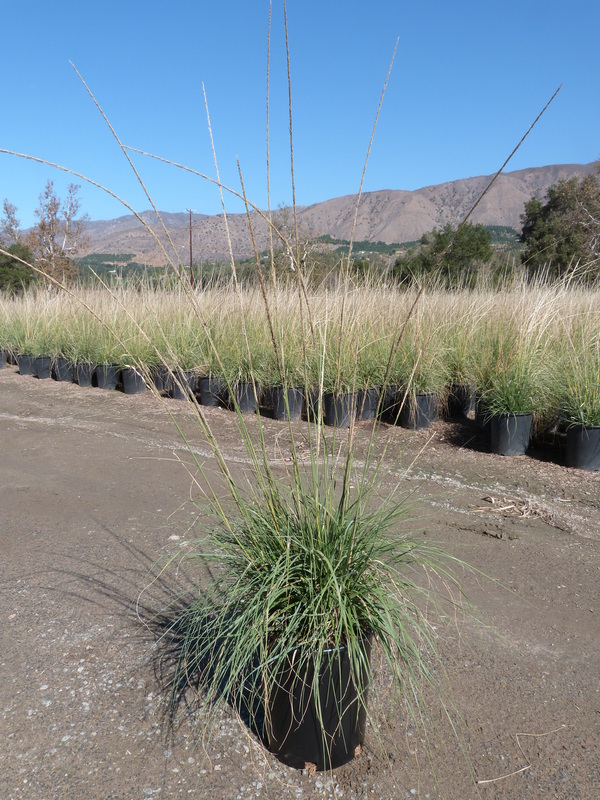 Muhlenbergia rigens, often called Deer Grass, this California native can be found growing naturally from Oregon, through California to Mexico and Texas. The stiff, upright foliage typically grows to three feet tall, while the blooms add additional height. The narrow leaves are complimented by its silver panicles (flowers) that sit two to three feet above the foliage. Its size makes it useful for creating height and mass in a low-maintenance landscape design. While its common name might indicate this grass makes a good meal for deer, they actually don’t feed on it; rather, the name comes from the fact that deer like to make a bed out of the grassy mounds! This grass is extremely drought tolerant once it’s established and can go for extended periods without supplemental water. However, it can also tolerate regular watering in a maintained landscape. It does prefer well-draining soil. Deer grass is a good companion for other Mediterranean type plantings.